Launched in 1953 at the London Motor show alongside the TF Midget, the MG ZA Magnette was greeted with mixed feelings both by enthusiasts and the motoring press alike. BMC, newly formed in 1952 after the merger with Nuffield and Austin Motors, had also misjudged the TF, as this model too was originally greeted with disdain. Leonard Lord who became chairman and managing director of the new corporation, initially favoured the killing off of the famous Nuffield marques, namely Morris, Wolseley, Riley and MG in favour of Austin. But this he was unable to do as compensation costs to existing franchise holders would have been very costly and would have caused tremendous emotional upset in the trade and amongst the car buying public. As a result, Lord came up with an ingenious idea which became known as "badge engineering". This meant that in future, BMC would produce basic models which could be adapted with different marque badges and trim levels at modest extra cost. This was a very clever move as it created the impression that the cars were quite different from each other. It worked well with Austin, Morris and other relevant marques but not so well with MG, simply because in the past most models had been unique to MG. In view of the exceptional sales achievements of MG in past years, Lord could not risk overlooking the potential and decided to try the same exercise with MG. This was achieved by allowing the cars to retain more of their own identity whilst closely associating them to at least one other car in the BMC range. The replacement for the Y series cars was well advanced before the Nuffield/Austin merger and was in the hands of designer Gerald Palmer. Gerald was originally working for the Nuffield Organisation before the war and had in fact designed the Y type saloon that did not see production until 1947. He had a temporary move to the Jowett camp where he was responsible for the Javelin project before returning to Nuffield in 1949 to be given the brief to develop a new range of saloons for Riley, Wolseley and MG. The merger in 1952 had little effect on Palmer's work and his projects were allowed to continue whilst colleague Alec Issigonis was assigned to the Morris products. Palmer designed two cars,one was a medium sized saloon that would carry the Wolseley and MG badge and the other was a far larger saloon that would sport Riley and Wolseley badges designated Pathfinder and 6/90 respectively. The smaller saloon was to be of unitary or what is better known as mono-coque construction and the MG version, which became the ZA Magnette was the first MG to employ this method of construction. Gone was the separate chassis to be replaced by a complete bodyshell which carried mountings for the engine gearbox and suspension. This type of construction was rapidly becoming popular in the 1950's in view of the fact that the car could be made much lighter whilst still retaining strength and rigidity, also unit costs were dramatically reduced when put into high volume production. 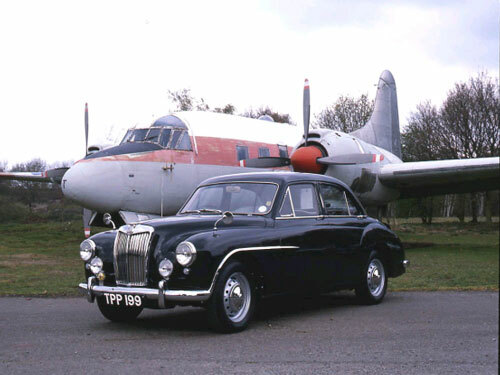 The Wolseley 4/44 preceded the MG ZA Magnette by a year and was launched in 1952. The delay on the MG was to allow the new BMC 'B' Series engine to be fitted along with other newly developed components, whilst the 4/44 had the XPAG series engine handed down from the Y type. Palmer wanted to differentiate between the two cars and did this by making the Wolseley the luxury car and fhe MG the sporting saloon. This was achieved by lowering the MG body by some two inches and changing suspension and shock absorber characteristics. This gave the MG a far more sporting-appearance as well as greatly improved roadhandling. Although basically similar in appearance, in the end many of the bodypanels were different. The only ones common to both cars were the roof, front doors and bootlid. The floor pan, rear doors, rear wings, front wings and sills were all different as was the bonnet arrangement. Each car had its traditional front grille and on the Wolseley this was fixed in the normal fashion with the rear hinged bonnet opening in conventional manner, whilst the Magnette carried the grille affixed to the front bonnet edge. The Magnette was the first MG to be fitted with the all new 'B' series engine. This twin carburettor 1489 cc unit was based on the 1200 cc Austin A40 engine which was first used in 1947, however the new engine was substantially modified and produced a healthy 60 bhp @ 4,600 rpm. This 'B' series engine certainly made the Magnette a good performer and was far quicker than its stablemate, the Wolseley 4/44 powered by the XPAG engine that could only muster 46 bhp @ 4,800 rpm. The Wolseley was also hindered by a non-positive column gear change whilst the Magnette had a new centre floor gear lever in keeping with its sports saloon image. The rear axle was also new and had a torque reaction arm to aid axle location as rubber bushes were used extensively in the suspension mountings to reduce noise, improve the ride quality and reduce maintenance. Suspension was independent at the front with wishbones and coil springs and semi-elliptic springs at the rear. Large 10 inch brakes all round catered for the increased performance. This very comfortable 4 seater was a civilised luxury sports saloon and despite its lukewarm reception at launch it soon became a sales success with customers loyal to the marque soon warming to it. With sales reaching around 6,000 units per year, the Magnette soon had a strong following and due to its superb handling and performance the car was achieving commendable results in international rallies and production car races. When production of the Magnette was well under way, Abingdon turned their efforts to the production of the all-new MGA which was launched in 1955. Whilst the MGA was furthering the MG tradition, the ZA Magnette was in need improvement although it had done much the same thing, albeit in a different market sector. At the latter end of 1956 the ZA gave way to the ZB which carried new refinements and a more powerful engine. Like so many MGs the Z series cars had been introduced to howls of disappointment, yet proved itself to be a thoroughly capable and much admired car with over 36,000 examples being produced.